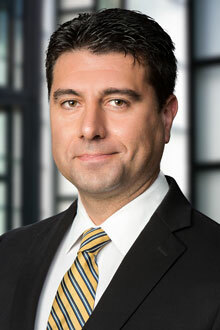 Tim Yianne is a partner in the Charleston office of Lewis Brisbois and a member of the General Liability Practice. Tim was born and raised in Charleston, West Virginia. He lives in the Historic District of the East End with his wife and daughter. Tim attended West Virginia University on academic and athletic scholarships, playing Division I soccer and lettering all four years, serving as team captain during his junior and senior years, and being honored as a Big East Academic All Star during his junior and senior years. After receiving his bachelor’s degree, Tim continued his education at West Virginia University by enrolling in the College of Law, seeking to pursue a career protecting the legal interests of individuals, businesses, state agencies, and municipalities in West Virginia. As a practicing attorney, Tim has tried multiple catastrophic injury cases in some of the most feared venues in West Virginia. Tim has served as monitoring counsel in several class actions filed in West Virginia involving approximately 300,000 residents whose water supply became contaminated from a chemical spill originating from an industrial complex. In addition, he has defended claims involving professional liability. Tim has received the highest peer review rating from Martindale Hubbell, AV® Preeminent. In 2019, Tim was selected to America’s Top 100 Civil Defense Litigators®. In 2018, Tim was selected by ALM and Martindale Hubbell as an Elite Lawyer of the South. Tim serves on the Board of Directors for the Ronald McDonald House of Southern West Virginia. He served as the President between 2013 and 2017. Crystal Good v. American Water Works Company, Inc., No. 2:14-01374, United States District Court, Southern District of W.Va.
Water Contamination Litigation, Civil Action No. 16-C-6000, Mass Litigation Panel of West Virginia Supreme Court. Opioid Litigation, Consolidated Civil Action No. 17-C-248, Marshall County, WV. United States District Court Southern District of W.Va.
United States District Court Northern District of W.Va.